Hey there, Creepy Peeps! For today’s Dissecting the Macabre, I’m going to discuss the common themes among horror films in the 1930s, with part of that discussion delving into specific parts from King Kong (Merian C. Cooper and Ernest B. Schoedsack, 1933). Which reminds me, if you haven’t seen my video about King Kong yet, I will leave it below. Movies have always been about escapism, and this was all too true for American during the Great Depression who were looking for an escape, and the horror movies delivered. Vampires, wolf men, giant apes and similar creatures make up most of the horror films in the 1930s, offering moviegoers an escape from the horrors of real life. Filmmakers tended to look back to the literary classics for inspiration during this time with films like Dracula (Tod Browning, 1933) and Frankenstein (James Whale, 1931), perhaps to influence the audience to find solace in the past. The story of King Kong is also a story of fantasy and days of old…and I mean really old. Not only to Carl Denham (Robert Armstrong) and his crew encounter Kong, they also encounter dinosaurs. Talk about escapism. All jokes aside, King Kong has some self-reflective moments that hold a mirror to what audiences were experiencing in their own lives. For one, we have Denham, who discovers Ann Darrow (Fay Wray) on the street, so hungry and poor she is stealing an apple from a vendor. Ann represents the audience, she is poor and desperate for something to take her away from her dreary life. Just like Denham, who whisks Ann away to a distant land for adventure, Cooper and Schoedsack take their audience on an adventure to a far away place. “King Kong steadfastly takes viewers through the gates of the real world lacking magic, happiness, and perhaps even romance and reminds them that there are places and things on this earth yet unseen by man” (Muir 187). King Kong is a film that makes sure you, as a viewer, knows it’s a film and that you are watching it: “[F]rom the presentation of the native dance to the Lost World dinosaurs and biplane footage, all of which recall Cooper’s background as a documentary filmmaker. A more explicitly reflexive strain runs through the character of Denham, who screen-tests Ann screaming, reminding the audience that Wray would have done just that, and presents Kong to his New York audience in the manner of a movie premiere” (Newman and Marriott 46-47). Cooper and Schoedsack create a unique film that manages to be self-reflective while also offering the audience an escape. It’s like the filmmakers wanted the audience to be aware they are using the cinema’s as a form of escapism and that they would go to see anything if it meant getting away from reality for a while. This resembles Denham’s attitude toward Kong; he knows it’s dangerous to bring the ape back to civilization, but he knows people will shell out any amount of money to see it. 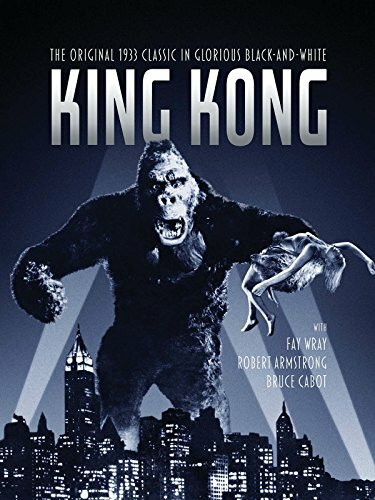 King Kong, like many horror films of the 1930s, offered audiences the chance to escae from modernity by whisking them away to an unknown land brimming with fantastical creatures and adventure. By presenting a story where a poor girl is whisked away, like the audience, moviegoers were looking in a mirror at their own situation. Well, that’s all I have for you today, folks! I’ll leave an affiliate link to King Kong below if you want to check it out! The works cited in this post are also below! Newman, Kim, and James Marriott. Horror! : the Definitive Companion to the Most Terrifying Movies Ever Made. Carlton Books, 2013.